As was previously mentioned, I loves me some Robert Downey, Jr. However, this does not mean that I think everything he does is brilliant, as well-evidenced by last year’s Sherlock Holmes. Yes, I am a fan of the literary Holmes, and yes, I was concerned about Guy Ritchie’s take on Victorian England. And actually, I thought that part worked rather well. Overall, the movie just dragged somehow and just wasn’t … that good. But, of course, this being Hollywood, we can look forward to a sequel sometime soon, and this time, supposedly, we will meet Sherlock Holmes’ great nemesis … Professor Moriarty. In the early days, it was widely rumored that Brad Pitt would be playing the mysterious professor. I have no problem with Brad Pitt per se; in fact, I think he’s a pretty decent actor. But as Moriarty? No. Wrong look, wrong abilities, and honestly, one faux British accent is enough. However! The rumor mill has begun churning again, and this time, I’m liking what I’m hearing. Yes. Daniel Day-Lewis. He’s British, he’s aristocratic and intellectual-looking, he’s got more than the requisite amount of acting ability, and really, the only question is whether not he’d want to do it, since he’s notorious for being rather an odd duck and only doing pictures once every few years. But besides, that, brilliant! That is a movie and a pairing that I think audiences would flock to see- myself included. On the chance that DDL says no, however, we do have some alternative names floating around out there in the ether. Also under suspicion (ha) are Sean Penn, Javier Bardem, and Gary Oldman. Let’s discuss. Sean Penn: Meh. I don’t have a lot to argue about here, but I just don’t like him, and I don’t think that he would be a draw on his own the same way that DDL would. Also, he’s a good enough actor, but he doesn’t have the charisma and on-screen presence that RDJ (and Jude Law, for that matter) does, and I think that would hurt the film overall. And again, why not get an actual Brit? It’s not like there aren’t a ton of them running around. Next? Javier Bardem: I love Javier Bardem, and I wish he would do more movies that I actually wanted to see instead of incredibly depressing dramas. However, I think that this particular idea is all wrong. He’s got the wrong look, never mind the notion of Moriarty with a Spanish accent. Besides, can you really picture Bardem as some kind of professor/scientist/whatever in Victorian England? No, I don’t think Moriarty needs to be a beefcake, any more than Holmes himself does. In formulating this argument I realized that it successfully eliminated my original #1 pick of Russell Crowe. Alas, I stand by the assessment. 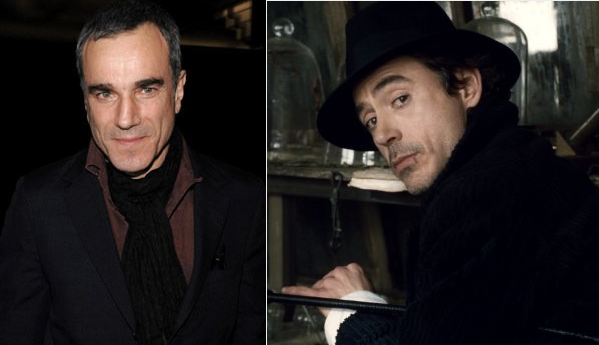 Holmes and Moriarty are really very similar, and so you want someone who is close to RDJ in terms of look, appeal, etc., but who is still markedly different. Where Holmes is kind of a mess, Moriarty is calm, cool, and collected. Moving on. Gary Oldman: This is the best option after DDL. British, right look, acting chops … my only real concern is that Oldman has sort of turned into a character actor, and I think I like him that way. His only big starring roles have sort of turned into scenery-chewing caricatures (see: Dracula, The Fifth Element). Additionally, Oldman almost always plays the bad guy. Yes, DDL has done a few villain turns as well (impressively so) but he’s much more varied in his choices, and this would be a fascinating one. So what do you think? I am firmly on the Daniel Day-Lewis train at this point, and I really hope something comes of the rumors. There are lots of villain character actors out there, a la Mark Strong and Gary Oldman, but for Moriarty, you need a star. Moriarty isn’t just some other villain: he’s the villain. Daniel Day-Lewis has the star power. He would bring in his own fans, he would give Robert Downey, Jr. a definite run for his money, and, well, he’d just be awesome. Anybody you’d rather see? This entry was posted in Literary adaptations, News. Bookmark the permalink. I will gladly hop aboard the DDL train for the same reasons you’ve listed above–he has the on-screen presence to support the sheer magnitude of playing Moriarty, the quintessential villain. Penn I don’t see having the requisite forcefulness of personality; Bardem is a bit too approachable (desirable?) to really fit the role; and Oldman…well, I love Gary Oldman, but his strength so often lies with his ability to make the audience identify with his character, whether he’s the good guy or the villain. There is no identifying with Moriarty, nor should there be. Having said that, I’d like to submit another candidate: Ralph Fiennes. He’s British, so no faked accent, and he has the capability for a forceful, detached on-screen presence. Beyond that, I think he and RDJ would make wonderful nemeses. Good choice. As you say, he’d be solid for all the same reasons as DDL, although perhaps not as much a “household name” these days. Plus, he’s working on Coriolanus right now, and I’d imagine they’re going to be getting going on SH2 ASAP. Awesome post, Sam! My first pick would be DDL as well, but another Brit that came to mind is Colin Firth. He’s sophisticated and has that ‘regal’ quality as well. Don’t get me started about Penn, just never been a fan of the guy either, and he’s just wrong for this role. Sorry, but I don’t see what’s desirable about Bardem… and I don’t watch enough of his movies to know if he can pull of a believable British accent. I agree that Gary Oldman would be the second best option after DDL. Fiennes ain’t such a bad idea either. A bold choice! It would definitely be interesting to see him play a true baddie … although, again, I think they’re going for serious star wattage, and he’s well-known in certain circles (mostly female), but I wouldn’t say across the board, necessarily. Still. Let’s hope they recognize there are plenty of good British picks out there without resorting to a Brad Pitt, eh? Exactly. Man I’d be seriously disappointed if Mr. Jolie gets on board, but we all know RDJ will blow him out of the water, charisma-wise. He’s just nowhere near his equal. I’d have to stand in support of the DDL train too 🙂 Or how about…..John Malkovich? I wouldn’t mind Rufus Sewell getting some screen time either. Mark Strong often reminds me of a bald Sewell..